Hay is situated half way along an old stock route called the Long Paddock that stretches from Echuca in Victoria to Wilcannia in New South Wales. It is a town with a history of welcoming travelers. Shearers arrived seasonally and swagmen intermittently. During the Second World War trains unloaded hundreds of German Jews who, having escaped from the Nazis to England, were transported across the world to the outback town as enemy aliens. Sanity finally prevailed after Winston Churchill's intervention and the Dunera Boys were released to fight Hitler both in the Australian and British forces. As with most of the outback's stock routes and train lines, the Long Paddock follows a traditional Aboriginal walking trail that relied on the most precious of outback resources, water. Water is what held Tommie and I here three weeks ago. We were trapped by the outflow from the Darling and the Murrumbidgee Rivers. We couldn't go north through Broken Hill or south past Deniliquin. Upstream Wagga Wagga was in crisis and the same Murrumbidgee waters were expected in Hay a week or so later. Hay is so flat that handbreaks are redundant. When it floods the water spreads like butter on a hot pancake. The landscape does not invite extravagance of any kind. If the level of anxiety in the town was rising with the river it was not noticeable. Like water to lime, floods have cemented communities like Hay together, adding strength to the collective spirit. I have always stayed a few days here when I'd intended only one. The sky is so big, so blue. The Wok in Hay does a great noodle dish. Actually it does a great pizza and fish and chips as well. The owners, John and Lon, remember Tommie and I from previous trips. It's nice. 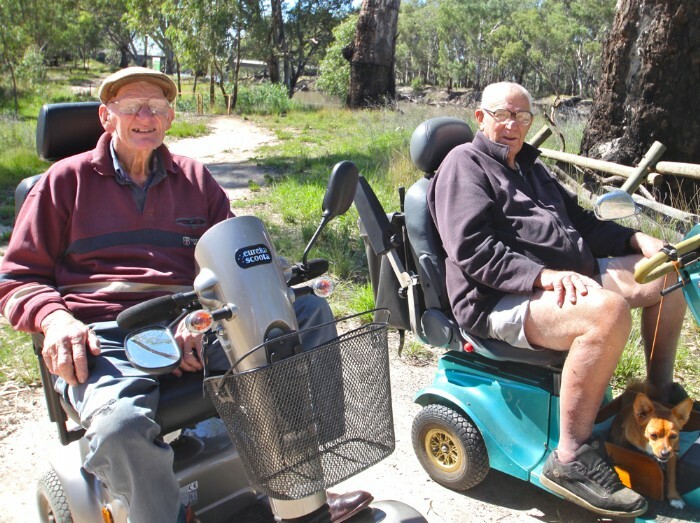 During that visit I met old Jeff and Ray who scream around in their geriatric-mobiles and have lived in Hay all their lives. When Jeff says something he adds "isn't that right Ray." When Ray makes a point "isn't that right Jeff" concludes his sentence. They were excited about the flood coming. It is an event. So when I arrived back this week and heard the town had weathered the flood I expected a buoyant atmosphere. It wasn't. At the Wok in Hay John explained why. The community had prepared for the flood by strengthening the levee that surrounds the town. It proved to be a formidable barrier with three feet of embankment spare after the river peaked. But victory over the river lacked a sense of triumph. As the waters approached so too did the S.E.S, the State Emergency Services, enforcing total control over the town, over people who had seen everything the river could do. They brought in their own caterers, helicopters and air conditioning units. They evacuated locals who would have once passed sandbags to each other or cooked meals through the night for their neighbours. As a kid John had been one of the Bank Men who monitored the rising waters. Says John, 'kids are being taught to leave" when a threat approaches. In fact the S.E.S handed out lovely new sleeping bags if they got evacuated, some lining up three times for a bag valued at $130 a pop. I have always marveled at the strength of communities to bond in a crisis. It becomes part of the town's folklore and collective soul. The people of Hay, or at the least the ones I spoke to, saw the C.E.S intrusion as an attack on the town's autonomy. The levee, built by the community with good local clay, withstood the flood. According to John, the C.E.S now want to remove and rebuild it because their engineers weren't involved. It can't be relied upon they say. Yep, that's the levee that worked. The people eating the various cuisines at the Wok in Hay all had the same message. That the town's integrity had been violated. God only knows what Jeff would have thought. Isn't that right Ray. Excellent reminder to all "authorities," Raymond. Fascinating response, and not unfamiliar to anyone aware of the proud resilience and self-reliance of small rural communities everywhere 'round the globe who have developed solidarity and sensible systems vs natural challenges. As you say, their distinctive identity and integrity are disregarded when the 'gods' swoop in without regard for local practices. Seems so patronizing when the locals are not even consulted about whether/how help should be implemented. I hope the harm can be reversed even if not forgotten -- and yup, People of Hay, it IS right to feel slighted and good to make it known. Whatever happened to consultation and co-operation? And why must we constantly fix things that aren't broken? Mind you, the boot would be on the other foot if things went haywire and there was no one there to help, so we take the good with the bad, eh? It was all meant for the good, after all. Hey Rosa.. They might well have used some help if they'd needed it but not for their town to be under an emergency law. There is also an assumption that experts always know more. Thanks for sharing the point of view of the people at Hay. I haven't heard this perspective before. It highlights the need for governments to follow-up on fine tuning their procedures to consult with locals and prioritise their spending. Let's hope there is more discussion. I think the trend is to more experts rather than less. The problem being that the law is clear and gives power to the authorities. It seems to me that the risk of losing a life in a flood is probably greater when an outside authority takes over but that's what drives this stuff now. No one will do a comparative study of the impact on a town of not being able to fight its own battles. Thin k the epidemic in youth suicide and depression which a sense of an active and engaged community counteracts. Thanks Annie. Whats fascinating is that this is simply reportage live from the Wok in Hay. The local people analysized exactly the sociological implications of the C.E.S intervention. The locals need to stand up for themselves and protect the levee from destruction. You can't trust experts when it comes to common sense and a fair go. Another beautiful post Raymond. You really are going from strength to strength. Thanks David ... Its a pleasure to write about this place. Hi Raymond, It seems I am a lonely voice here, and I don't expect you to publish this. I just felt the need to vent my feelings after reading your blog. I fear I would get a lot of flak. I am quite astounded by the response of the people of Hay and some of the comments. So much so, that I now think twice of ever again donating money to small communities who may be in need of help of some kind or another. I do understand that the people of Hay felt invaded, but I guess this was a situation of "damned if you do, and damned if you don't". Spare a thought for the �misguided� volunteers, who often leave their loved ones at short notice in order to attend to someone else's need, work long, unregulated and unpaid hours, and who thought the people of Hay may welcome their help. May be the good folks of Hay could inform the SES and the government not to bother in future no matter of what happens. As for catering and hotel accommodation; The SES is only partially funded by State governments and relies on donations for additional funding. The volunteers go where they may be needed and hostility by town's folk is really misplaced. Self-catering of a group is a lot cheaper and far easier to organize than relying on local businesses and sending volunteers all over the place to pubs, hotels, sandwich shops, etc. to find and pay for their own food and then try to reorganize them again where they may be needed for their volunteer work. I would never have the heart to ask a volunteer to make sure he/she takes enough money so they can stay in the local motels, purchase counter lunches and hotel dinners, and support the local economy. Some Hay people seemed to have been greedy enough to line up for more than one sleeping bag! This certainly is not the fault of the SES, but kind of shows another side of the good folks of Hay, that is that they have no qualms to exploit the SES and as such also my donations to the SES. Communities do pull together during emergencies but, as the Queensland floods have demonstrated, often a lot of heartbreak, including financial difficulties, unemployment, depression, and family breakdowns follow a disaster after the initial drive to go through this together has passed. May be everyone in Hay had flood insurance so it would not have mattered to them if the place had been flattened. I also assume that the 'intervention' was only temporary. Hi Cecilia I think that point is that the community can not request that agencies don't come. It is the Law. The feeling was very strongly that they weren't listened to. That people whose lives had been spent in the community and whose houses were threatened were strongly encouraged to leave. I also got no impression that the SES people were volunteers. This was a state response. There was no attempt to enlist support of the community and it is that effect on the culture of such a unilateral action that is worth noting and discussing. Kids anywhere will line up for what they can get. That's what kids do. I don't think it suggests that the people of Hay are greedy. The people were saying it was an unwanted lesson in greed. In fact I always stay because it is such a welcoming place. The Dunera Boys still hold reunions in Hay after 50 years. Lifetime friendships have been forged. Aboriginal swagmen used to pass through the town and be made to feel welcome. Swagmen lived in Swagman's Bend without a problem. No one in Hay was saying don't help. But allow a town to help itself. As it turned out they knew EXACTLY what they were doing and built the levee with a solid margin of error. Regarding all the dislocation and effects. I am sure the people of Hay understand the threat to lives and property. That's why they work together. But the soul of a town is dependent upon a lot of things like standing together and a sense of self reliance.That's what allows them to resist other catastrophes like drought. Your comment is your view and is both warranted and welcome. The point is not to decry the worth of emergency services but to note a deeper complexity in this case. Hi Raymond, Have you read "Why Warriors Lie Down and Die", by Richard Trudgen? This is just such a book, and a must-read.